Riverside Academy was established in 1970 to fulfill the educational needs of students in the parishes of St. Charles, St. James, and St. John the Baptist. It is a school comprised of grades pre-K3 through 12th grade. The school site covers 20 acres and consists of 10 buildings. The faculty at Riverside Academy realizes that the school must meet the needs of all students whether they plan to attend college, vocational technical school, or enter the work force immediately. The Riverside Academy curriculum is diverse in its nature to meet the needs of each of our students. The curriculum offers a solid foundation for those students desiring to attend a two or four-year college, as well as those desiring to pursue a trade or attend a technical college. The flexibility of the curriculum enables our students to exercise the freedom of choice while encouraging critical thinking and decision-making skills as they grow and mature into young adults who will contribute positively to society. The school’s athletic programs are very successful and have earned state championships in football, basketball, baseball, softball, and golf. Athletic teams in track, swimming, soccer, volleyball, powerlifting, and cross-country are also a part of the school’s athletic program. The school also has an exceptional music program beginning in grade 4. A concert band and marching band are included for students in grades 7-12. Choir and theater are also offered in the high school grades as elective classes. Riverside offers many other opportunities for students to join various clubs or sports teams and to participate in student government. 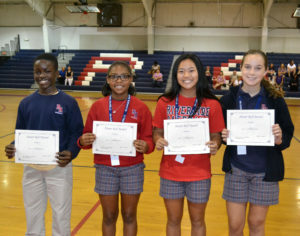 As students enter middle school, faculty and administration encourage participation in clubs, teams, and organizations. Involvement in academics, clubs and sports is pertinent for a successful transition from middle school to high school. 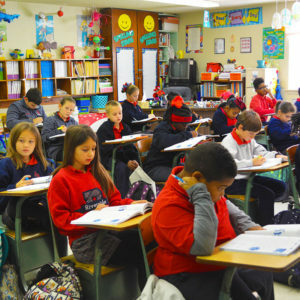 The curriculum, expanded to include seven class periods each day, is made up of the core curriculum (English, Math, Science, and Social Studies), as well as classes in art, music, computer, library, writing, journalism, and study skills. Middle school students also participate in school-wide activities such as Carnival Ball, Beta Club, Band, Athletics, and many others. Similar to high school, award ceremonies are held at year-end to celebrate students and their achievements. Riverside Academy is truly a unique place. In a time when students may attend as many as four different schools prior to high school graduation, Riverside Academy offers the opportunity to enter at age two and graduate from high school without ever changing schools. The elementary school at Riverside provides a sound education for its students. Textbooks are kept current, and all children are instructed on grade level. For students who need more one-on-one instruction, Riverside offers the services of the Learning Center. The faculty believes in strong academics but also considers the students’ social and psychological development a top priority. In addition to providing top academic programs, Riverside offers a variety of extra-curricular and academic enrichment activities for students in all grades. All students from grades one to three participate in a general music program, and by fourth grade students are learning to read music and play instruments. From third grade to fifth, the boys have an organized football program, and the girls have a combination cheerleading/dance group that they may join. In the fall, Biddy Basketball is offered to students from grades one to five. Riverside also has a boys and girls elementary soccer program and a swimming program. Riverside Academy is proud of its award-winning 4-H program, which is open to students in the upper elementary grades. Elementary students are also included in many of the assemblies that take place on campus; Friday pep rallies during football season among the favorites. Strong academics, a variety of extra curricular activities, and a caring, compassionate faculty make the elementary school at Riverside Academy the best in the River Parishes! Academics is the core of Riverside Academy. As with any school, we must meet minimum state requirements to remain compliant, however, we go above and beyond minimum state requirements and will add and amend to the curriculum in order to deliver the highest in educational standards. Check out the academics sections below! The faculty and staff of Riverside Academy strive to accommodate all students with a rigorous curriculum to prepare them to be life-long learners. We understand that children have a variety of learning styles and needs to be met when inside and outside of the classroom. Academic Enrichment offers students a chance to discover and promote their art abilities while reviewing academic lessons. Students participate in art-integrated activities with a full-time staff member. The Athletic P.E. class is a Performance Training program focused on the physical fitness of each student athlete training throughout the school year. A vital component of our overall athletic program, our performance training program serves to improve the overall strength, conditioning, athleticism and toughness of every athlete at Riverside. Our program is designed to meet the needs of every student-athlete at our school, male and female, in-season and off-season. A personalized strength program is written by our strength and conditioning staff and adhered to by each student-athlete year round. Our athletes train in a first-class facility with the very best equipment under the direction of two full time strength coaches. The program is designated for grades 9th-12th. PreK students will be provided with interactive instruction to master the 31 ELA skills and the 13 mathematics skills derived from Louisiana’s PreK Grade Level Expectations. Staffed with a full-time tutor, the Learning Center is designed to meet the needs of exceptional learners at both ends of the spectrum. Students needed reinforcement of basic skills, as well as those achieving above their grade level, participate in extra learning opportunities. Students are given the opportunity to begin music lessons with our band director beginning in first grade. Each year, students play an instrument and make progress towards participating in the full marching band. Learning appropriate exercise and taking care of the body are important in the development of a child in elementary. Our program is designed to promote the President’s Physical Fitness Award. The Riverside faculty has commenced training in vertical teams to organize a series of productive activities, meetings, and workshops to lead to a comprehensive, coordinated program so that no instruction is isolated. A planned program of teaching skills and concepts over the school years of the student will lead to a continuum of skill building from one grade level to the next. Students learn to apply past instruction to new and more challenging material that will prepare them for AP courses. A Pre-AP program has been instituted in English to focus on AP readiness skills to increase the number of students who can enroll in the high school program and improve achievement in AP courses. Students will be instructed to develop close reading skills, good writing skills, presenting solid arguments, critical thinking skills, and comprehension skills. Mathematics teachers will focus on problem solving skills, measurement, patterns and functions, geometry, and graphs using innovative teaching strategies. These include projecting measurement techniques and labeling manipulative, instant assessment of student response and templates for graphs and geometric shapes. 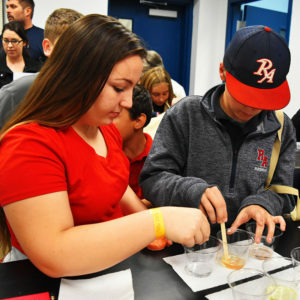 All students are exposed to hands-on science, not only through their classroom teachers, but also through participating in labs with the high school students and science teachers.